LiveAdmins provides real-time engagement with your website visitors. With our solution, your education institute can answer student queries pertaining to academic programs, admission requirements, fee structure, scholarships, and campus life. Our service enables 24/7 assistance to prospective and current students in making the most educated choices. Our solution is simple, effective and packed with powerful features. Through our Proactive chats, we are able to meaningfully engage with students and help them with their queries in real time. 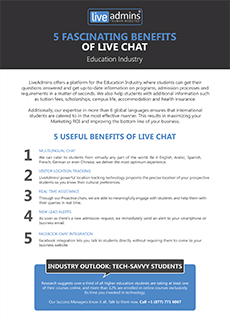 Our Live Chat service supports 4 languages so you can cater to a wider audience. Our ICR system distributes chats based on agent availability, language settings and level of training. Our AI interface will re-engage the visitors who visited your website previously and will serve them with more relevant content. With Involve, you can secretly assist the agent on how to handle a difficult situation or completely takeover the chats for full control. We will help you promote special offers with easy-to-set-up banners so every visitor gets to see them as soon as they land on your website. Some of the leading universities and educational institutes are our clients. In 2016, we have conducted over 1.06 million chats for our education industry clients, and achieved 80% student satisfaction. Does the service stop if there are any problems? The service is designed in such a way that it would not stop regardless of what the problem is. Unless there is an issue from the customer’s side, any issue can be settled immediately. On which platforms does live chat work? Be it a desktop, tablet or mobile – our chat system is fully responsive thereby delivering optimum visitor experience on every platform. Absolutely, we ensure that our customers are provided with 24/7 chat support without any interruptions, delays or lags, all year long. Fill out this form now to see how our solution can make a difference to your educational institute.